Taylor is looking for a new start. Ken made a commitment he won’t break. Neither of them realizes their future began decades in the past. 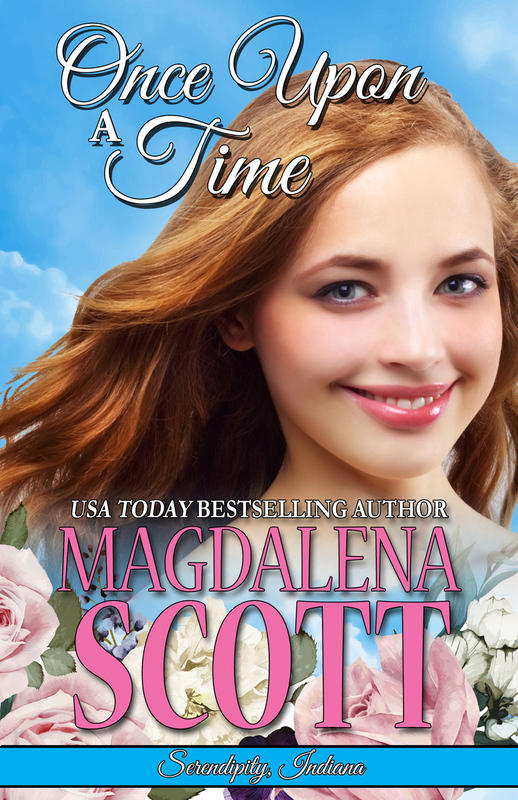 Taylor Kincaid and her twin, Hannah, have graduated college and are ready to leave Serendipity forever… The only problem is an absence of jobs in their fields. They decide to move back home temporarily, living with their parents again, and taking a little sabbatical from all the hard work (and partying) of college. But Marcus Kincaid has different expectations of his daughters. The free ride is at an end, and they have to get jobs in Serendipity if they expect to live at home. Hannah accidentally volunteers to work at the Standish Family Christmas Tree Farm with their sister Emily (Kincaid) Standish. But Taylor decides to float resumes in the little town, and find a job that will pad her bank account, and be easy to leave when the right employment opportunity comes along. It’s a great plan, until she steps into the antiques shop on the town square, and meets its handsome, enigmatic new owner. Now leaving may be more complicated than staying. 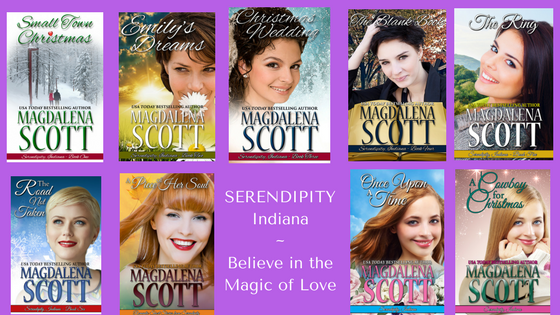 Sweet romance, “coincidences” that might be more than that, and a love that survives the unthinkable come together in this new Serendipity, Indiana tale. Here’s what you need to know about me. I’ve always been a realist. I never believed in love at first sight, fate, or serendipity. Well, except for the Serendipity I was raised in—that’s the name of my hometown in the quiet, rolling hills of Southern Indiana. But that mumbo jumbo people say, like, It was a match made in Heaven. Or It was meant to be. Seriously. I wouldn’t get sucked into that kind of thinking. The only kind of woo-woo I knew about first-hand was the twin kind, and that’s DNA or something really boring and scientific, right? I know twin coincidences are real, because my identical twin sister Hannah and I have lived plenty of them. But what I didn’t realize was, I’d be permanently changed by what happened on that cold, rainy day when Hannah and I were twelve years old. We were being punished for something—I don’t remember what, but knowing the way we were back then, I’m sure it was well deserved—and had no screen time. Phones and laptops were confiscated, and we had the day to nurse our anger, stuck together in the room we shared. But we slipped up to the attic, moving silently, so we didn’t get into even more trouble. That day Hannah and I were on a mission to find something to entertain us. Of course there weren’t any tech items, but in our desperation, we were just looking for something different. The attic was stuffed full of old furniture, cartons of Christmas decorations, and loads of other boxes, some of which weren’t labeled. Hey, it was better than sitting in our room staring at each other, or trying to re-read the books and magazines we had. Once we’d created space to access it, she tried to open the heavy metal latch. I moved piles of old magazines and catalogs off the top, onto an empty spot on the floor. I hit my head on the steeply slanted eave when I stood up. Down on my knees next to her, I looked for something to pry up the lid, and finally found a paint scraper. “Who knows how long this thing has sat here.” I worked for a bit before the top suddenly flew upward. I was quick enough to catch it before it, too, got whacked on the wooden roof brace, announcing to Mom that we were in the attic. The wedding dress was on top, folded between layers of tissue paper. I picked it up and the thing unfurled, the weight of the heavy satin sliding out and down with a soft, sighing whoosh. Hannah reached out a hand and smoothed it down the skirt. “Wow. It’s beautiful.” She got busy with the trunk, digging out a pair of white leather slippers with low heels. I was awash in cold chill, holding the dress, watching Hannah. Her voice seemed to come from the bottom of a deep well. Flashes of scenes flew past while I imagined the girl who owned this dress, and planned her wedding to take place in our backyard, under a big white tent. Not hundreds of people, but still a crowd. Bride’s side, groom’s side, and one attendant each. The girl’s sister was her bridesmaid, wearing a dress of similar cut, but in pale pink. The flowers, the music—provided by someone in the house playing piano—and the windows open so the sound wafted out to the guests. The yard I imagined was much bigger than ours, because there weren’t other houses around. Just our house, the lawn, and beyond that, acres of fields. Then I was being shaken, pulled away from the wedding scene. I blinked, remembered where we were and what we were doing, and took a deep breath. I carefully folded the dress back and Hannah helped me return it to the layers of tissue. But we never found anything else in the attic that held our interest, or excited our imaginations, like the contents of the trunk. The trunk was our secret for a long time. For Hannah it was entertaining, but for me it was more than that. It wasn’t until years later that I realized how much more. Hannah and I had packed our stuff. Mom drove her van, and Dad his pickup, to help us haul everything from our college dorm in Bloomington back to Serendipity. Good-bye, Indiana University, awesome seat of learning and partying. Leaving was sad on so many levels. Hannah was driving our jam-packed Ford Focus, following Mom and Dad along Highway 37 south. “I’m not staying a single day longer than I have to,” she said, referring to moving back in with our parents. Going home to Serendipity seemed our only option. We both loved Bloomington and would have enjoyed staying there. But without decent paying jobs, we couldn’t afford it. We both had polished our online resumes, and our Linked In profiles were sparkled to the max. We should be heading in a completely different direction at this moment. Toward our future, instead of toward our stupid, boring past. I knew what she meant. Most of our friends had found jobs in their fields. She and I weren’t top in our class—we had spent plenty of time partying after all, not to waste that opportunity. But we’d had decent grades, were intelligent, and quick learners, if someone would give us a chance. Her degree was in Environmental Management, and mine was Marketing. We rode in silence quite a while, each picturing how awful it would be. Serendipity, Indiana, population about six thousand boring people, had little to offer anyone our age. The nearest entertainment was the Louisville, Kentucky area, just under an hour away. Plenty of movie theaters, shopping, restaurants, and bars there, all of which required money. “I don’t have much cash left after we filled the gas tank today,” Hannah said—a statement she had already made when we were at the gas station. “Well, it’s not like her wedding was a big event. But yeah, that wreck had to hit them hard, right in the bank account. We can’t say anything to them about it, though. They’re always so, We’re lucky she didn’t die, and look how great she’s doing now. We’d been through this too many times. We wouldn’t be able to change our parents’ reaction to what had happened, yet we kept struggling to accept it. We passed the small houses, small businesses, a bank, and at the stoplight, could see the castle-like courthouse a few blocks away, to our right. Then we picked up speed again on the other side of town, and ten minutes later pulled into the driveway of the two-story white clapboard house we had grown up in. Hannah and I shrugged in unison. “It’s not our fault if she’s carrying more than she can handle,” I said defensively. Click here to go back to the Serendipity page to see all the books.